8th Annual Quilt Show: September 6-8, 2018 at the Greenback Heritage Museum. The Greenback Heritage Museum is holding its 8th Annual Quilt Show on September 6, 7 and 8, 2018. The show is open from 9AM to 4PM each day. Entries may be dropped off Aug. 28, Aug. 31 and Sept. 1 between 10AM and 2PM. 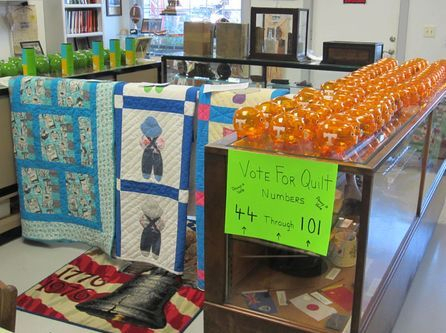 You may enter as many quilts as you wish but only one prize can be won by any individual. Quilts will be judged by show attendees and museum patrons by placing pennies in the piggy banks associated with each display item. Cash prizes will be awarded for 1st, 2nd and 3rd. Quilts may be picked up on September 8 from 4 - 5PM or the next week during regular museum hours. Quilt Shows take place each year, usually in the first or second week of September. For more information, call Barbara Davis at 865-660-0123 or Sandra Tipton at 865-856-2944.